You ARE amazing. What better than a card to tell you that? Recently I saw a piece of fabric with a vintage design on it – roses galore, that were all a vintage brown color with pops of green for leaves. The empty space between the clumps of flowers was a soft, watercolory, distressed area that got darker at the edge of the flowers. I totally should have taken a photo, because all I have for reference is what’s in my head! See it come to live by watching the video below or click HERE to see it in HD on YouTube. Gotta love a sentiment like this too….so many amazing people out there we can send cards like this to! I also colored a similar card with Copics – and black ink. Love these, Sandy! Reminds me of the pattern of the material on a small old chair that we had done up. I was thinking only yesterday (for the umpteenth time) that I should try my hand at creating a similar pattern on a card. You’re so right that inspiration is all around us. Last year I was paying frequent visits to the physiotherapist and I would take pictures with my phone of patterns and colour combos I saw in the magazines I was browsing in the waiting room. Love this! Also left a bit longer comment on the video. Came back here because wanted to share a link of a second video that I watched that was in the same email as your video. Benefits of Crafting /ART TRIBE by Craft Test Dummies. Thought you would enjoy her thoughts. Love your work girl!! Stunning. I’m not that brave. You are amazing, that is all. 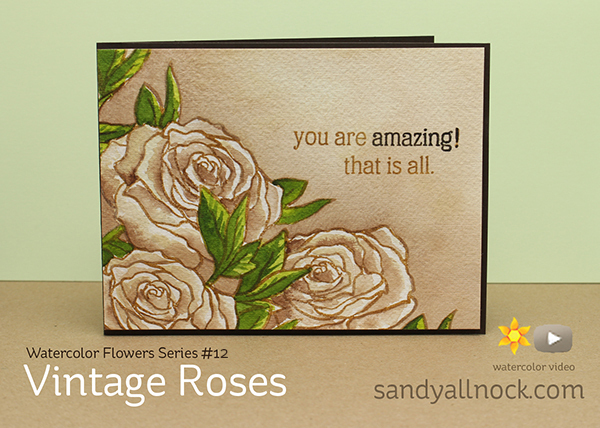 You are so inspiring and vintage roses in watercolor are magnifico. both are amazing and awesome! These are so beautiful…..much like you. Oh, Sandy! Your vintage roses are truly gorgeous!! Thank you for reminding us that inspiration is everywhere. These sentiments are pure perfection, too! I love, love, love your Watercolor Flowers series! YOU inspire me, Sandy!! WOW…. Absolutely stunning and beautiful, Sandy! Thank you for the video! 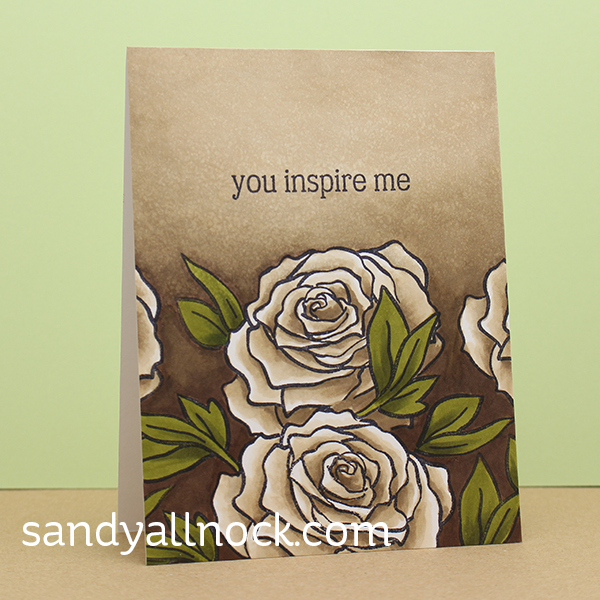 Ooooohhhhhh….. Aaaaaaaahhhhhh Like the cards say: YOU are amazing….. and YOU inspire ME !!! 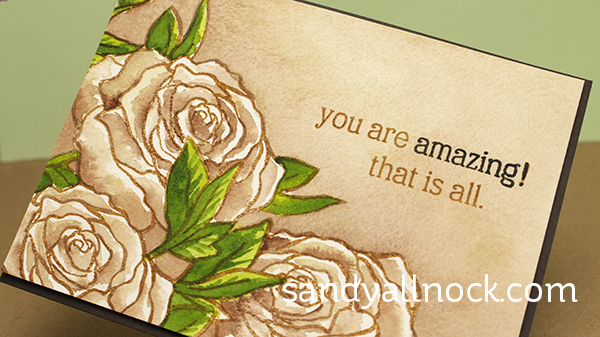 Amazing is the perfect word in that sentiment for that gorgeous card! I love the vintage colors for the roses and cards. Amazing work. These are both stunning Sandy. I love seeing the process and where I am trying to learn, I get to see the options of what water colours might be best for me to buy to best fit my needs. TFS! Oh wow!! I LOVE both versions of the cards. You rock at this!! This is FABULOUS! Sitting here with my coffee, you make me think even I can do this! lol Just wonderful!!! Thanks so much! Both cards are beautiful, but there’s a certain “something” about the watercolor version that is very swoon worthy. Thanks Sandy! I LOVE your Watercolor Flower Series Sandy! I get so excited when I see a new wc floral tutorial video from you! I learn so much from your videos & really enjoy your painting! Please continue the Flower Series & the Watercolor Paint Along Series, I loved the Paint Along Series too so much!! Thank you! !